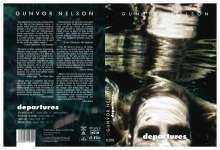 Gunvor Nelson is a painter, photographer and master of personal film and video. A celebrated artist in her native Sweden, she pioneered personal filmmaking in California from the 1960s to the 1990s. "Schmeerguntz is one long raucous belch in the face of the American Home. A society which hides its animal functions beneath a shiny public surface deserves to have such films as Schmeerguntz shown everywhere – in every PTA, every Rotary Club, every club in the land. For it is brash enough, brazen enough and funny enough to purge the soul of every harried American married woman." "My Name is Oona captures in haunting, intensely lyrical images fragments of the coming to consciousness of a child girl. A series of extremely brief flashes of her moving through night-lit space or woods in sensuous negative, separated by rapid fades into blackness, burst upon us like a fairy-tale princess, with a late sun only partially outlining her and the animal in silvery filigree against the encroaching darkness; one of the most perfect recent examples of poetic cinema."